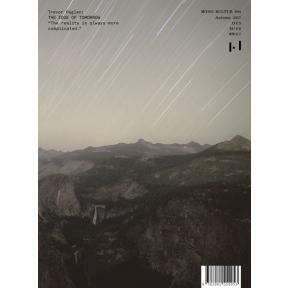 Issue #44 of mono.kultur might just be our most adventurous yet: traveling from the deserts of New Mexico to the exclusion zone in Fukushima, from satellite orbits in space to the inner realms of Artificial Intelligence, our conversation with American artist Trevor Paglen is as expansive as his work is ambitious. Best known for his series on clandestine military bases and spy satellites, Trevor Paglen’s practice reaches far beyond museum walls. Instead, it encompasses a variety of disciplines; from image-making and installations to investigative journalism, writing, engineering, geography, and sound design. Along the way, Paglen challenges our traditional notions of fine art. He has published a number of books on the functioning of the US intelligence services, installed a series of Autonomy Cubes that allow access to the entirely anonymous Tor network, and is currently working on his own satellite to be launched into space in summer 2018. Holding degrees in comparative religion, music composition, fine arts, and geography, Trevor Paglen is undoubtedly concerned with the larger questions in life. In pieces that are statements as much as they are questions, his work exposes the invisible mechanisms of modern existence, exploring the human condition in relation to the political, social, military, and economic systems our societies operate on. In a sweeping conversation with mono.kultur, Trevor Paglen talked about the volatility of truth, the dilemmas of the Anthropocene, and why Artificial Intelligence will not outlast humanity. True to its precious content, the issue comes in a Static Shielding Bag normally used for sensitive electronic products. In loose reference to computer coding as well as archival documents, it contains a main booklet with the text and excerpts from Paglen’s current cycle on machine vision, as well as six ‘attachments’ covering seminal projects from his career to date.